Ara Grigorian is the international award-winning author of GAME OF LOVE, his debut novel. He is a technology executive in the entertainment industry. He earned his Masters in Business Administration from University of Southern California where he specialized in marketing and entrepreneurship. True to the Hollywood life, Ara wrote for a children's television pilot that could have made him rich (but didn't) and nearly sold a video game to a major publisher (who closed shop days later). Fascinated by the human species, Ara writes about choices, relationships, and second chances. Always a sucker for a hopeful ending, he writes contemporary romance stories targeted to adult and new adult readers. 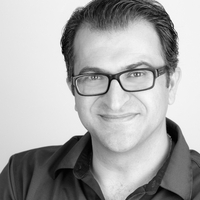 Ara is committed to helping writers tell better s Ara Grigorian is the international award-winning author of GAME OF LOVE, his debut novel. He is a technology executive in the entertainment industry. He earned his Masters in Business Administration from University of Southern California where he specialized in marketing and entrepreneurship. True to the Hollywood life, Ara wrote for a children's television pilot that could have made him rich (but didn't) and nearly sold a video game to a major publisher (who closed shop days later). Fascinated by the human species, Ara writes about choices, relationships, and second chances. Always a sucker for a hopeful ending, he writes contemporary romance stories targeted to adult and new adult readers. Ara is committed to helping writers tell better stories. He is the co-founder of the popular Novel Intensive seminar. Also, he is a workshop leader for the Writer's Digest Novel Writing Conference, the Santa Barbara Writers Conference, and the Southern California Writers' Conference (both Irvine, CA and San Diego, CA). Ara is an active member of the Romance Writers of America and its Los Angeles chapter. To ask Ara Grigorian questions, please sign up. Ara Grigorian Hi Elen! Yes, I am :) My grandfather was also a writer many decades ago, so I guess it's in the blood. I hope you enjoy the book! Please let me know. …moreHi Elen! Yes, I am :) My grandfather was also a writer many decades ago, so I guess it's in the blood. I hope you enjoy the book! Please let me know. Ara Grigorian There are two phases that I love: the idea creation and revision. When a new idea comes to me, I feel the same excitement I felt when I met someone…moreThere are two phases that I love: the idea creation and revision. We’d love your help. Let us know what’s wrong with this preview of Dive Smack by Demetra Brodsky. We’d love your help. Let us know what’s wrong with this preview of Dark Paradise by Gene Desrochers. For tennis fans and booklovers who want to discover and discuss books and literature about the drama-filled sport of tennis. Helene wrote: "I'm sure all these groups keep you busy." I'm sure all these groups keep you busy. Thanks for the add Ara. xox! Nice to be friends! I see we have lots of books that we like in common!